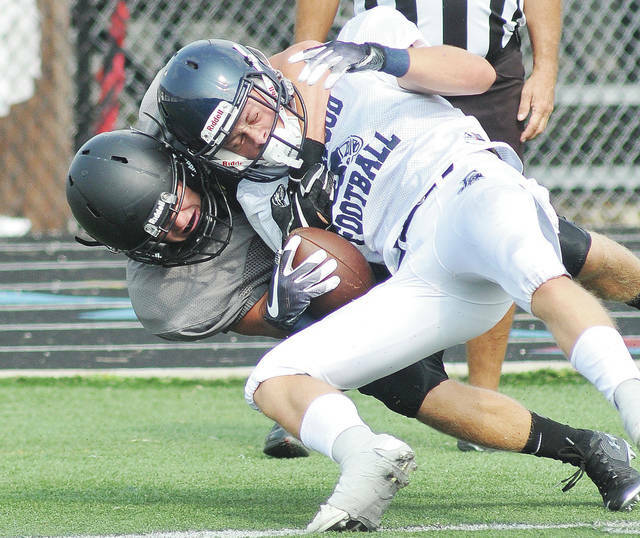 Sidney’s Caleb Harris brings down an Edgewood runner during a scrimmage at Trenton Edgewood on Aug. 11. Harris is one of several returning starters in the backfield for the Yellow Jackets. Sidney’s Josh Hartlet makes a tackle during a scrimmage against Chaminade-Julienne at Roger Glass Stadium in downtown Dayton last Friday. The Yellow Jackets will open the season on Friday at St. Marys. SIDNEY — Caleb Harris shared the exhilaration of Sidney’s seniors after the team opened with a win over St. Marys last year. To make it two in a row this year, Harris said Sidney will have to put up a huge effort on Friday. The Yellow Jackets will travel to St. Marys Memorial for the last time in the foreseeable future on Friday to open the 2018 season. They’ll try to beat the Roughriders in consecutive seasons for the first time since 2012-13. Sidney hadn’t beaten St. Marys since 2013 before last season’s seven-point win. Harris, a senior receiver/defensive back who has started since his sophomore year, said the win was the launching point for Sidney’s 10-2 campaign. St. Marys has 10 letterwinners returning from last season. After opening the season with a 39-32 loss at Sidney, the Roughriders won 10 consecutive games before losing in a Division IV regional semifinal. The Roughriders have one key piece of their wing-T offense back in senior running back Sean Perry, who ran for 1,136 yards and eight touchdowns in regular season last year. Braeden Dunlap looks to take over at quarterback. Doenges said both Perry and Dunlap are capable runners — as is just about anybody else for St. Marys that will carry the ball. “There’s a lot of spread, but there’s still a lot of teams that do wing-T throughout the state and our area, but I just think they do it a little bit better,” Doenges said. “I think it goes back to coaching and Coach (Doug) Frye has been running that for 30-plus years. It’s ingrained in the kids, it’s ingrained in their system and it’s ingrained in that community. 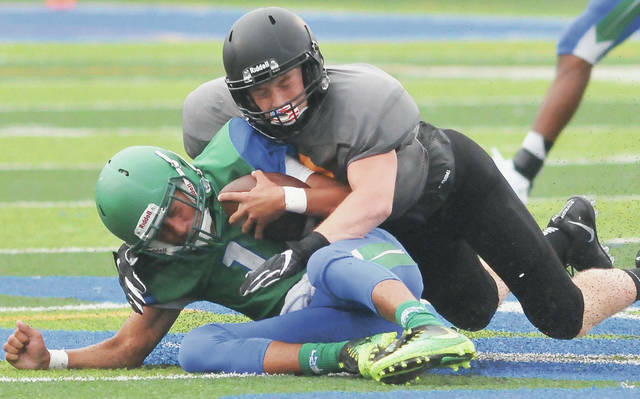 The Roughriders racked up 398 yards of offense against Sidney last year. Harris said being disciplined is the key to containing St. Marys. The game will be Sidney’s last trip to St. Marys for awhile. The Yellow Jackets will be joining the reformed Miami Valley League next year and will play a nine-game league schedule starting in 2020. They’ll keep Bellefontaine as their lone nonconference opponent. Sidney and St. Marys will face off in Sidney in 2019. Frye is in the fifth year of his second stint at St. Marys. He led the program for 11 years before leaving in 2008. He returned to the school in 2014. Doenges is a 2001 St. Marys graduate. He was a part of the first class Frye coached for four years. Doenges said he likes the progression he’s seen from Sidney’s defense this preseason. The unit ranked near the bottom of the 20-team Greater Western Ohio Conference in yards and points per game last year but has nine returning starters, including Harris. Sidney gave up several big plays in a 33-21 scrimmage loss to Chaminade-Julienne last Thursday, most of which came on third down. Doenges said playing defense against St. Marys can be a bit like standing at the plate against a good pitcher. “In this past couple of years against St. Marys I know we’ve given up some points — it’s like you’re a baseball player at the plate and you keep sitting on the fastball, which is their dives, sweeps and traps. I think we’ve done a pretty good job at that,” Doenges said. Harris played a lot at wide receiver last year in addition to starting in the defensive backfield. He’ll hardly have a play off this year, as he’ll take on a bigger role in Sidney’s offense. Aside from receiver, he’ll also see time at running back. This will be the final season St. Marys plays at Skip Baughman Stadium. The district is constructing a new stadium near an existing turf field at the high school. It will also likely be the last of many games Doenges has witnessed at the stadium. “I sat with my Mom. We had reserve seats, just me and Mom,” Doenges said. “Dad was usually busy with stuff on the farm, and Mom was into football. I would say I sat with her from kindergarten all the way up through eighth grade. I didn’t go sit with junior high kids or anything. I didn’t go running around. I sat in the stands and was into it. Reach Bryant Billing at 937-538-4818, or follow @SidneyOHSports on Twitter and @BryantBillingSDN on Facebook.